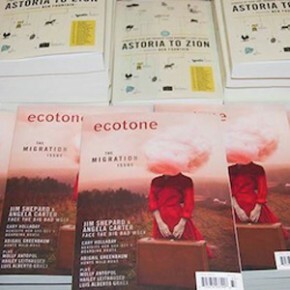 To commemorate Ecotone’s tenth anniversary, Lookout Books announces the publication of Astoria to Zion: Twenty-Six Stories of Risk and Abandon from Ecotone’s First Decade. Over the past month, we’ve teased you with first paragraphs, as well as introductions to some of our favorites, but now we bring you something more visual. Starting every Monday, we’ll post a digital broadside that pairs a compelling image or graphic with a short excerpt from a story in the collection. Look for this series every Monday and be sure to check our blog for additional updates. Don’t forget to follow us on Facebook, and you can also find our digital broadsides on Pinterest.